Each week, we name the Lone Star Grille/100 Degree Hockey Player of the Week. Lone Star Grille offers happy hour weekdays from 4-7 PM just minutes from the Cedar Park Center. The new Higher Ground Bar at the Grille is a smoke-free bar open 6 PM to 2 AM Thursday, Friday and Saturday. Redeem your game ticket for reverse happy hour from 10-12 PM with $2 off specialty cocktails, $4.00 house wine and $2.50 domestic longnecks. 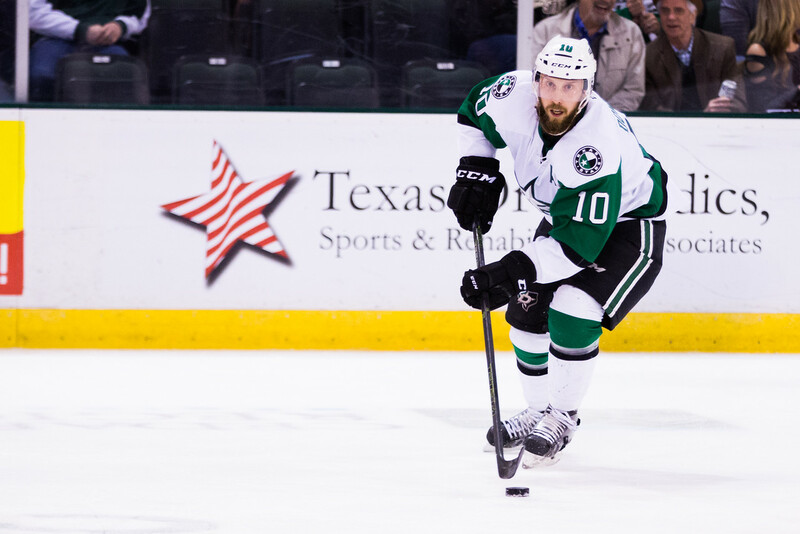 After two months out of the lineup, it didn't take long for Justin Dowling to make an impact on the Texas Stars. Last night in his return, he had a pair of assists and was a major workhorse on the faceoff dot en route to a 5-2 win over Iowa. The Stars were suffering over the past few weeks as all but two of their natural centers were out of the lineup. When someone had an off night on the dots, it affected puck possession and the ultimate toen of the game quite a bit. Coach Laxdal noted that having Dowling back gave him another option, especially on defensive draws. That was doubly important as he said that Dickinson was having a rough night on the dots. Without Dowling to take those key draws, Texas would have been up a creek on faceoffs for most of the night. Dowling admitted he felt pretty tired after the game and had to do a bit more in-game to keep himself hydrated and feeling fresh. Linemate Brendan Ranford praised Dowling's off ice work ethic during his injury and credited his conditioning to that work ethic. With Travis Morin and Greg Rallo skating but not yet ready to play, the Stars will surely continue to lean heavily on Dowling for the time being.